The 2012 Odyssey was awarded Motorweek Driver’s Choice Award for Best Minivan. Car and Driver awarded the Accord as a top pick a record 26 times. “Honda makes a great product. Consumers want to know their vehicles will last for years to come,” said Phillipe Ackerman, GM of Honda Mall of Georgia. There are fewer vehicles on the side of the highway due to engine failures or maintenance issues. Honda will own it’s fair share of responsibility for this. When considering depreciation, insurance, maintenance & repairs, Honda maintains the lowest cost of ownership over all competitors for every model in its lineup. In addition to its record for long lasting vehicles, Honda continues to receive accolades year after year. Honda’s longevity combined with the incentives during the Really Big Sales Event has pushed Honda sales forward for 2nd quarter. Through April 29th, consumers can pay zero down, and zero first month’s payment on select vehicles. 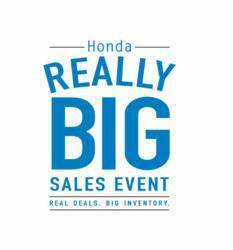 Visit http://reallybigsalesevent.com/ to learn more about the Really Big Sales Event as it enters its final week. RITZ Marketing represents the Penske Automotive Honda dealers in the Central US region, as well as the Detroit Area Honda Dealers. Ritz Marketing manages the Really Big Sales Event url at http://reallybigsalesevent.com/. Kathleen Ritz, Ritz Marketing, Inc.